Alright boys lets see em'. How did you all do on the first day of hunting? I still need to wait until Thursday morning before I'm in my stand so I'm hoping to live through the rest of you until then. We are sitting at 3 does and some gold ole fashion flubs. Did not hear alot of shots in the morning but plenty in the evening. I would assume the full moon has something to do with it. Couple more weekends to fill tags. Here you go boys. 2 from the trailcam. 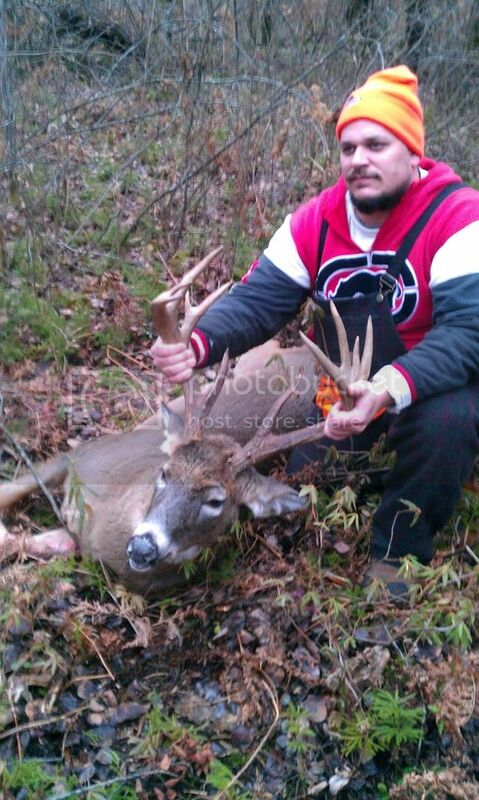 The big heavy racked buck is on the ground! Taken by my brother, who also bagged 2 more 8 pointers...what a dog! I saw plenty of deer, just no biggins from the cam, so I will wait till next weekend. No real breeding going on yet, bucks were by themselves just poking around, the next weekend will be cranking. The wolves were on a gut pile in the dark when we were only 150 yards away in the dark dragging, pretty spooky, so the wolf tag has to wait. Hopefully, not too long. Still 4 more biggins out there from the trailcam!! Nothing makes a brother more green than a 3 buck weekend! I am envious! 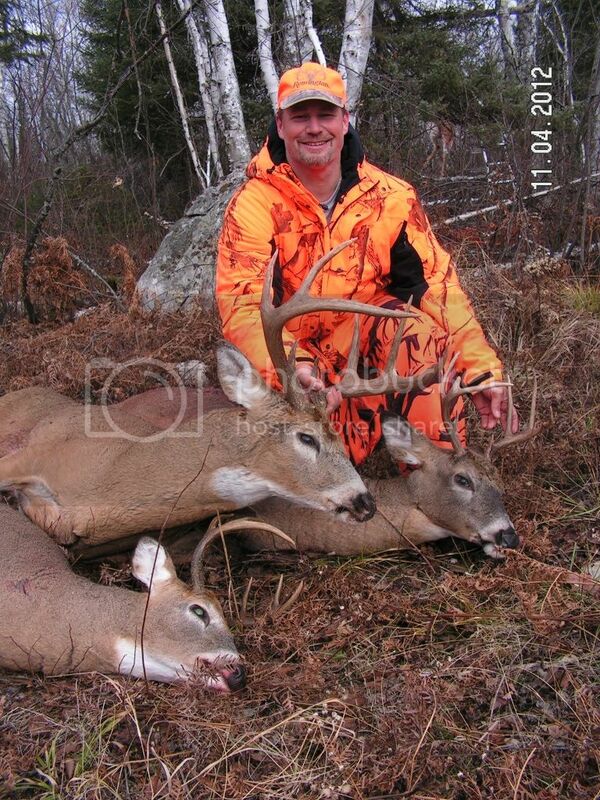 Nice bucks. Did he shoot all three? I think my 2 hunting buddies would kill be if I shot 3 bucks and had to use their tags. 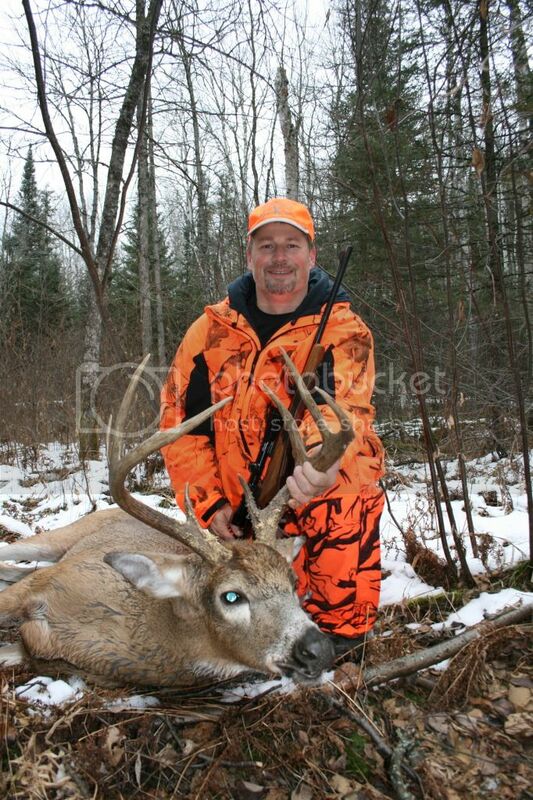 I will be honest I have a tendency to like the muzzleloader season more and more every year. Regardless of when you hunt...good luck!!! I hope you can round out your fall exercise program for the "guns" with a few 10 pointer-ups for the camera! I just updated my brothers picture to a new and better picture! Well my season is over and it was pretty awful. 4 days in the stand for at least 8 hours each day and I saw exactly ZERO deer while in the field. Had 4 guys in the party and they all saw the same exact thing. Most excitement was my buddy had a bobcat walk with 20 feet of his ground blind on Saturday morning. We hunted Thursday and part of friday in the area we had prescouted but saw no movement and very little sign. Another group showed up Friday morning claiming to have built a bunch of the stands we had seen so we deferred to them and let them have the spot. It wasn't worth fighting over since there was little activity in the area. After getting bumped from that spot we fell back to plan B and split the group and hunted 2 separate clear cuts. Luckily they were both void of other hunters so we went out friday afternoon and got set up in a few promising areas. Found more fresh sign in these areas so we were encouraged. But then the weather went south. Spent all day Saturday hunting in rain and windy. Somehow managed to avoid any sort of motion sickness even though the tree I set my climber on was swaying pretty good at times. Any shot that day was going to be tricky as even if the deer wasn't moving I would be as the tree swayed. So after 128 man hours in the field we came up empty. Only deer we saw were on the drive to and from the stands and they were all on small private parcels next to a large farm. I think next year we are going to look at some new areas and see if we can't get on some better hunting.